Texas Democrat gubernatorial candidate Wendy Davis received a hostile greeting in Los Angeles Thursday morning, when life-sized posters depicting her as “Abortion Barbie” began popping up throughout the city ahead of her fundraiser there. 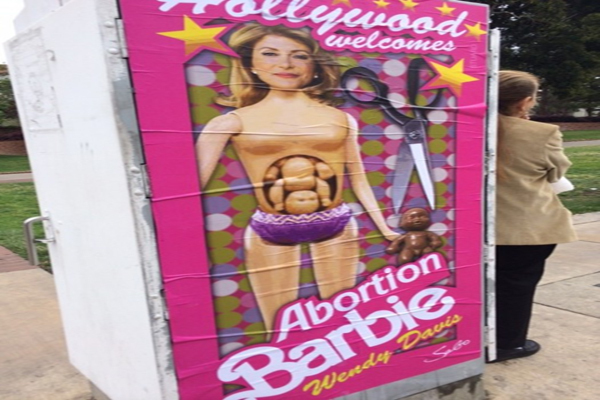 The posters say “Hollywood welcomes Abortion Barbie Wendy Davis,” and they show Davis’ face on a mostly-naked Barbie doll with a plastic baby in her belly. I happen to love it. No justice, no peace, and it draws more attention to the late-term abortion queen of the Lone Star State. Conservative pundit Erick Erickson nicknamed Davis “Abortion Barbie” earlier this year because when she was a state senator, she won national media honors for filibustering a ban on late-term abortions. Davis’ campaign told The Huffington Post that it spotted at least five of the posters in different outdoor places around the city, including one on the campus of the University of California, Los Angeles. Hollywood superstars J.J. Abrams, Jeffrey Katzenberg and Steven Spielberg are hosting the soiree, according to ABC News. The event, which will reportedly be held on the roof of Abrams’ production company Bad Robot, costs guests $1,000 at the door. The Dallas Morning News reported that a guests’ status at the event depends on how much he or she donates to Davis’s cause. A $10,000 contribution allows a party-goer to become a co-host; a $25,000 donation constitutes host status. Turns out the poster’s funder is Texas conservative Kathryn Stuard. EMILY’s List, a PAC that only supports pro-abortion Democrat women, is up in arms, calling this “one of the most offensive, disgusting, sexist posters that I’ve ever seen,” in an email alert.